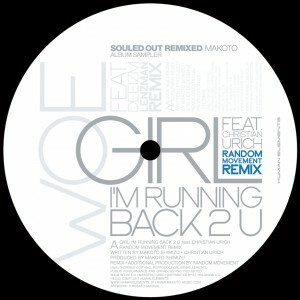 Taken from “Souled Out Remixed” album which brings a new perspective to Makoto’s 2011 album “Souled Out” by featuring remixes from Makoto himself, Lenzman, Random Movement, Sinistarr, Ena, Bun and Jabberloop. Marking a departure from the 130BPM, 80’s disco style of the original version from Makoto’s last album Souled Out, this remix ups the energy level from the beginning with Random Movement’s super sharp drum beats, bringing out a drum n’ bass vibe all whilst preserving the trade mark clear 80’s-sounding synth, guitar sounds, and Tortured Soul front man Christian Urich’s soulful vocals. The baseline will give you goosebumps when it first comes in, but continues throughout with a bouncy groove. This is definitely one tune which will surely get the dance floor going with its upbeat energy! This remix is exactly the high-quality work one would expect from Metalheadz soul boy Lenzman. The soundscape of lush synths and his trade mark deep, smooth bass line fits perfectly with Deeizm’s vocal and lyrics. It captures the emotional and soulful essence but still retains an energetic groove, something that only Drum’n’Bass can do.